Before I start, let's just make one thing perfectly clear: I come to bury Castro, not to praise him. At any rate, when Prime Minister Justin Trudeau issued a warm statement of condolence yesterday to "the family, friends and many, many supporters" of former Cuban president Fidel Castro, who died on Friday at the age of 90, the Canadian Right, including candidates for the leadership of the Conservative Party of Canada, was seized by a collective fit of apoplexy. Surely it did not assuage their spittle-flecked fury that Trudeau noted in his 188-word message that Castro was "a legendary revolutionary," "made significant improvements to the education and healthcare of his island nation," and had "tremendous dedication and love for the Cuban people who had a deep and lasting affection for 'el Comandante,'" while also acknowledging that the Canadian PM's late father, Pierre Trudeau, "was very proud to call him a friend." It started on social media, naturally, with would-be great helmsmen or helmswomen of the CPC vying to contribute the most biting denunciations of Trudeau, accompanied by a host of commentators from the their own online anger machine and the newly respectable American ultra-right. Helpfully, the soon-to-be digitized National Post was eager to curate these 140-character jeremiads into a single story for the convenience of its dwindling readership. "A despicable dictator," huffed Maxime Bernier. "Apologize and retract," demanded Lisa Raitt. "Disgraceful," barked Ted Cruz, the junior senator for Texas, pitching in, I guess, because he was born in Calgary and is therefore a Canadian citizen … Oh, wait! 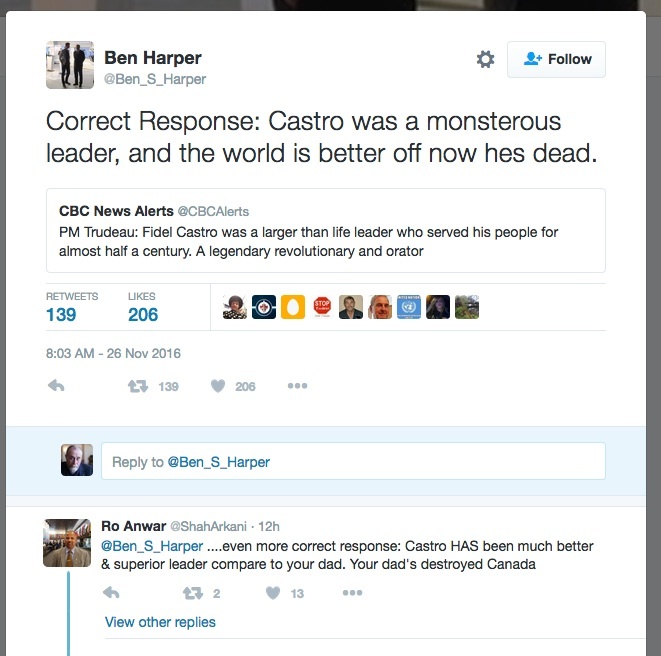 A Queen's University student named Ben S. Harper -- apparently Harper fils -- Tweeted "Castro was a monsterous leader, and the world is better off now hes dead." The younger Harper's poor spelling and punctuation, one hopes, were understandable byproducts of his passion, not the quality of his education. Whatever, there are a lot of larger-than-life leaders in this world who are controversial figures, to borrow a much-objected-to phrase from the PM. Still, I couldn't help casting my mind back to last year's death of King Abdullah bin Abdulaziz of Saudi Arabia, and the condolences on that occasion published by … the prime minister of Canada. King Abdullah, who was the hereditary leader of by almost any measure as repugnant a regime as can be found on the surface of this planet, died on January 23, 2015 -- although it was still January 22 in Ottawa, owing to that international date-line thing. At any rate, what is striking about that event is the reaction -- or, rather, the almost complete lack of any reaction -- to the statement of condolences issued by the prime minister of Canada, who at the time, of course, was the aforementioned elder Harper. "On behalf of all Canadians, Laureen and I offer our sincere condolences to the family of King Abdullah bin Abdulaziz and the people of Saudi Arabia," said Harper, going farther than Trudeau's statement, if you ask me, since the latter prime minister never claimed everyone in Cuba, let alone its Miami suburbs, loved Castro. "King Abdullah was recognized as a strong proponent of peace in the Middle East," said Harper, or some flunky in the PMO, at any rate, paid to stuff words into the prime ministerial mouth. "He also undertook a range of important economic, social, education, health, and infrastructure initiatives in his country." "I had the pleasure of meeting King Abdullah in Toronto when Canada hosted the G-20 and found him to be passionate about his country, development and the global economy,” Harper continued. "We join the people of Saudi Arabia in mourning his passing." This sounds remarkably similar to Trudeau's statement about Castro, don't you think? It was certainly as bad by the same logic -- if you hold Conservative prime ministers, that is, to the same standard to which Conservatives apparently hold Liberal ones. Well, in fairness, there may have been some grumbling at the time by the usual left-wing malcontents -- perennially disposed to disapprove of dictatorial monarchies that torture and murder their own citizens, persecute many on religious grounds, not to mention for driving while female, drive down the price of oil to the detriment of Alberta and, what's more, discreetly finance terrorism over here in the democratic West. But, what the hey! We were selling the peace-making king's security apparatus that $15-billion dollars' worth of armoured cars, a sale that Trudeau, it turns out, was as anxious to complete as his predecessor. This may account for why Harper's government was prepared to spend $175,000 to send Governor General David Johnston on a 40-hour trip to the desert kingdom to offer Canada's condolences on all of our collective behalf. Johnston was accompanied by a spokeswoman, an official photographer, a bodyguard, and two government "program officers," whatever they may be. These expenses did not, mind, include hotels or meals. Well, you can't expect the Governor General of Canada to sleep under the stars! I suppose Canadian taxpayers of the Harper era could count themselves lucky. Our neighbours to the south in the Land of the Free and the Home of the Brave, whence comes a lot of the current outrage about Trudeau's condolences, sent a 29-member delegation to bid farewell to King Abdullah that included President Barack Obama, Secretary of State John Kerry, House Minority Leader Nancy Pelosi, CIA Director John Brennan and numerous factotums! After all, one person's murderous sponsor of terrorism is another's noble peace-making king! We must certainly acknowledge that not everything was rosy in Castro's Cuba, which incarcerates 510 prisoners per 100,000 in population, according to the (imperfect) list of 221 nations published by the Wikipedia, leaving it only seven steps from the bottom. Only such jurisdictions as the United States -- 693 per 100,000, not counting in the case of the U.S., inmates in U.S. territories, military jails, immigration jails, jails on First Nations reserves or inmates held in juvenile facilities -- do worse. Indeed, only the lowly Seychelles has more people per capita behind bars than do our next-door neighbours. By other measures, however, Cuba does better -- for example, infant mortality. Perhaps thanks to the significant improvements to health care during Castro's rule that were cited by Trudeau, Cuba has a respectable infant mortality rate of 4.63 per 1,000 live births, very close to Canada's rate of 4.65 and much better than the rates of 5.87 in the United States and 14.09 in Saudi Arabia. Could the unhappiness of the U.S. Government with Castro's and Cuba’s defiance have anything to do with this outpouring of outrage on the right in Canada? D’ya think?